Quarks combine to form neutrons and protons. Due to circumstances still unknown, the amount of matter and the amount of antimatter in the Universe was no longer equal. The excess matter in quarks came together in a specific combination of three quarks to make either a proton or a neutron. The quarks that did not combine were annihilated. Thus, by 102 seconds (a little over one and a half minutes after the Big Bang), all protons and neutrons had formed. Click "Play" to see how protons and neutrons come together to form atomic nuclei. By 102 seconds after the Big Bang, all protons and neutrons had formed, and these nucleons began to fuse together to form atomic nuclei in a process known as nucleosynthesis. The CMB as Surveyed by the WMAP Satellite. The formation of atoms at the division between Era 2 and Era 3 corresponds directly with the decoupling of light and matter. Once atoms formed, light and matter stopped constantly interacting with one another, and photons were suddenly able to travel freely. As a result, the Universe became transparent. 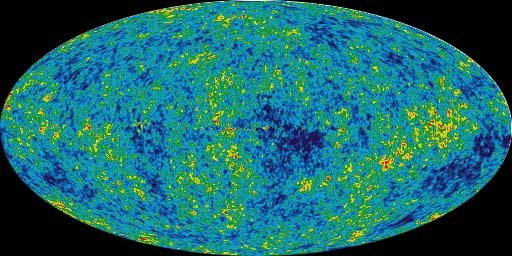 Scientists refer to this epoch as the "Surface of Last Scattering;" light from this period is observed today as the CMB!